Use the sun to heat your water year-round- no freezing! Halco has decades of experience helping customers choose the right system. Free Estimates for solar water systems! Solar heating systems are primarily used to heat domestic hot water. For certain types of new super-insulated homes, it can also be used for primary space heating. Systems are composed of flat plate or evacuated tube collectors which use the sun to heat a heat transfer fluid, and move that fluid back to exchange that heat with water in a storage tank. A solar heating system can help save you money on your water bill. As an expert home energy contractor, we offer a variety of energy improvement solutions to improve the comfort of your home and lower energy costs. We provide renewable energy, home insulation, HVAC, tankless water heaters, plumbing and electrical services and home energy assessments. We provide Free Estimates for solar heating and other renewable energy services in Rochester, Ithaca, Syracuse, Auburn, Webster, Pittsford, Cortland, Canandaigua, Fairport and surrounding areas. Solar heating systems are best located on a relatively unshaded south-facing roof surface or ground location. Unlike solar electric systems, which are typically mounted flush to the roof surface or at an average of 35° for ground-mounts, solar heating collectors are typically mounted at steeper tilts to maximize winter production and reduce extra summer heating. For best integration and aesthetics, Halco prefers to mount solar heating collectors on steep roofs, ground locations, or as part of building awnings. Please note that for ground-mounted systems, pipes must be buried from the collectors to the house. Because of these pipe runs, systems can usually be located at a maximum of 200-300 ft from your home. Typically, homes in New York use around 40,000 BTU per day to heat water for domestic uses like showering, laundry, and washing dishes. The energy input for heating whole homes varies more widely, and the average home uses around 300,000-800,000 BTU per winter day. These BTUs can come from a variety of fuels such as natural gas, propane, fuel oil, or wood. The first step in considering one of these systems is to provide our staff with the last six months to a year of your heating bills, and we can assist you in determining your average heat loads. These heat loads will then be used to calculate the number of collectors needed to meet your domestic hot water needs and building heating needs. For most homes in New York, domestic hot water needs can be met easily, but whole home heating is usually only possible for super-insulated homes with an extremely low BTU/hr or BTU/day requirement. When the home heat load is too high, we often recommend geothermal heating as a better option. 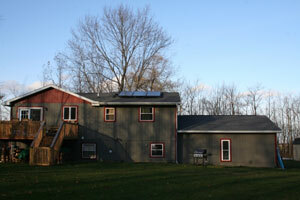 We also offer solar thermal systems, which uses solar panels to heat hot water. Contact Halco today to schedule a free cost estimate for renewable energy upgrade or installation in your home. From wind power and solar power systems, we're the energy company for you. Our service area is throughout New York, including: Ithaca, Rochester, Syracuse, Geneva, Penfield, Brockport, Hilton, Spencerport, and the surrounding cities and towns!